The MaxCoin time with CPU mining was very short and now everyone is mining with GPU as soon as it became available, so the MAX crypto continues will full throttle. If you are looking into mining MaxCoin with GPU, then you might find this helpful – download CUDAminer for Nvidia with keccak support or download cgminer 3.6.6 with keccak support from the link below if you are mining with AMD graphics cards using OpenCL. The keccak version of cgminer miner may not be 100% stable, but it will restart again if there is a problem and it crashes. 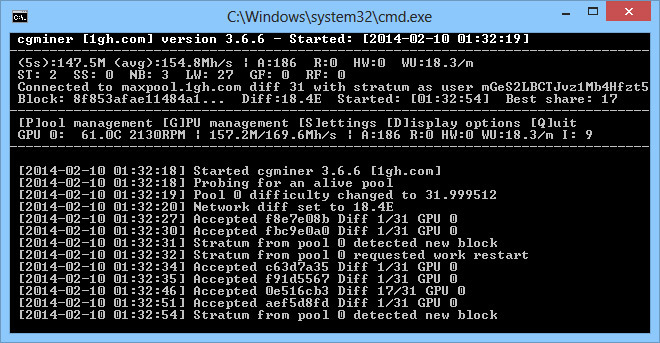 And as a suggestion for a pool to mine MaxCoin in – try 1GH. Ypool has already closed their MAX pool due to the serious DDoS attacks that MaxCoin pools were getting since the crypto has been announced a few days ago and 1GH seems to have resolved their problems with the attacks they were getting as well and are probably one of the largest if not the largest MaxCoin pool at the moment. There is now a newer version 3.7.2(3) available that is much more stable and reliable than the version 3.6.6.